Inder Loves Folk Art: Pattern Testing: Alder Skirt. 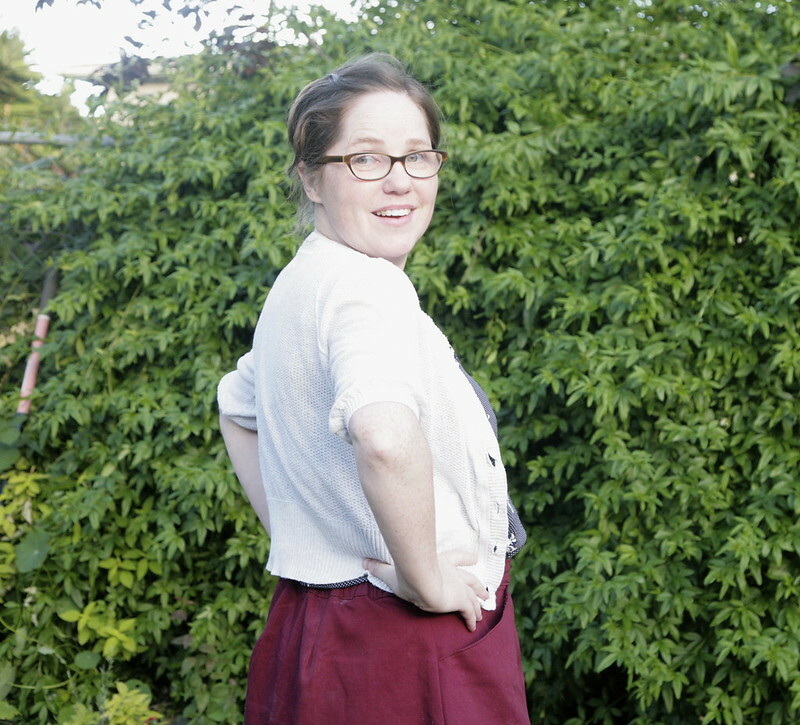 I finished my test Alder Skirt this morning and proceeded to wear it for the rest of the day (happy mother's day, everyone!). So here it is all rumpled after a busy afternoon. Hey, the sun was way too bright for a photo shoot until early evening! In real life, my skirt is often rumpled. So I'm just keeping things real here. Rachael at Imagine Gnats kindly let me test this pattern even though I have a somewhat spotty record with pattern testing her designs, I'm afraid, and this time was no different. I missed the deadline by about five days (EEK). But the good part of that is that I got to read all of her notes and errata while I was working on this. And the pattern went together pretty easily with that clarification, so I think I can safely tell Rachael that the testing is done, and she can go to print (tomorrow is the release date, I think!). The pattern has four panels, an elasticized back waistband, an inverted center pleat, and pockets that bow out slightly from the skirt. I love these pockets. 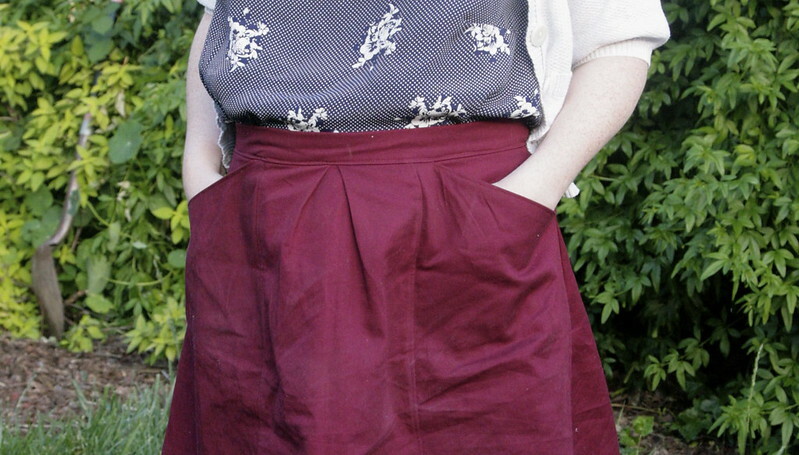 In a perfect world (i.e., the next time I make this skirt) I would deepen the pockets even more and spend all of my time with my hands in my pockets. I used a maroon cotton twill for this tester version. I love the color, but the fabric is a bit stiff for such a full skirt. Next time I will sew it up in something with a bit more drape. It's so hard to find soft and sturdy bottom-weight fabrics! I'm not 100% in love with the elasticized back on this skirt, but again, I think the stiff fabric is part of the issue there. The fabric wants to stand away from my body. Hopefully it will soften up a bit with some washing. But it's not too bad, and it's nothing that a longer cardigan couldn't hide, so this skirt will definitely be getting some wear. Final notes: Seeing as this was a test, I made this up precisely as instructed, based on my measurements. 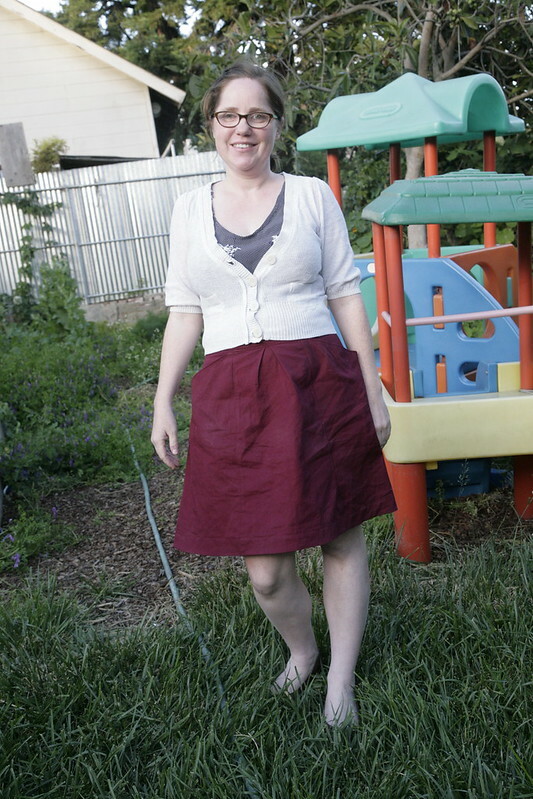 The skirt turned out to be pretty short by my standards (I prefer not to show my knees! ), so I used bias hem facing to hem it, rather than the 1" hem in the instructions, saving myself a critical 3/4" of hem. But in every other way, it is an unaltered size 8. Next time I will use a softer fabric (this would be great in baby wale corduroy ... isn't everything? ), lengthen the pocket bags for nice and deep pockets, and add three or four inches to the hem, to allow for a nice, deep, heavy hem weigh down the hem and balance out the fullness on top. 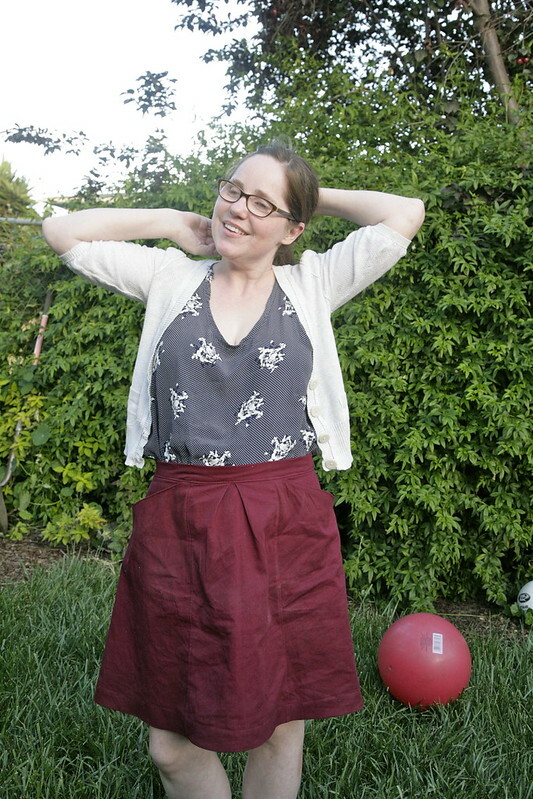 I also think this skirt would look great with a wider waistband, or eliminating the center pleat ... so many options! Thanks for letting me test your awesome new pattern, Rachael! You look gorgeous and it will definitely soften up. Elastic backs make for great 'home' skirts. This looks great - love the colour. I love the color! I was able to rest the girls version and I'm dying to make one for myself! I never tuck my shirts in so I'm afraid the pockets may not be seen much but they will be used! So pretty, Inder! I love that last photo of you! And the third one, too. (But of course they are all nice!) :) The color of the skirt is beautiful and looks absolutely lovely on you! Looks like a very wearable skirt and those pockets look fantastic! I'm always a fan of pockets. 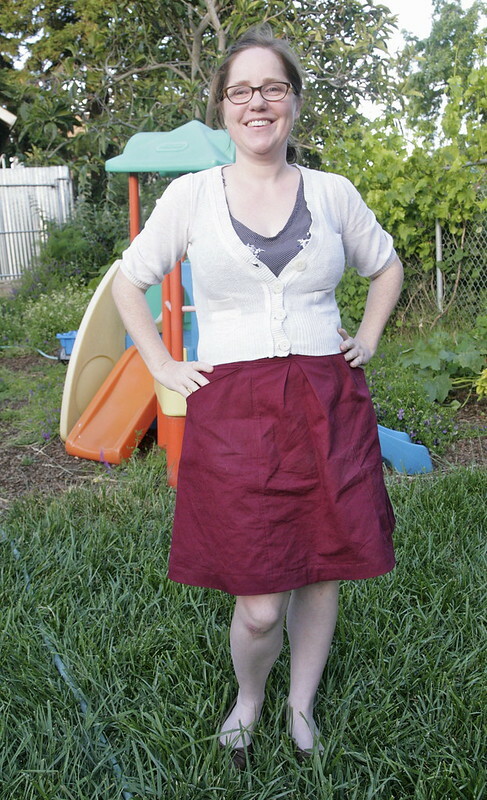 How do you think the fit on this compares with the Liesl + Co Everyday skirt? I was thinking of buying some kind of skirt pattern for this summer.